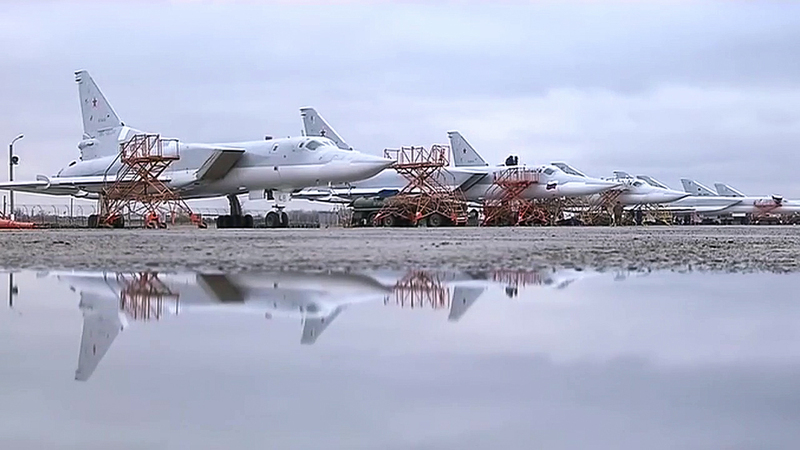 Tupolev Tu-22 M3 strategic bombers of the Russian Aerospace Force prepare to hit ISIS targets in Syria. The raid from the Hamadan airbase marked the first time when Russia's aviation has used an airbase in Iran for striking the Islamic State terrorist organization in Syria. Russia’s Tupolev-22M3 and Sukhoi-34 bombers took off from the Hamadan air base in Iran to launch a strike against militants in Syria on Aug. 16, the Russian Defense Ministry said. "Long-range bombers Tupolev-22M3 and frontline bombers Sukhoi-34 took off from the Hamadan air base in Iran carrying a full bomb load to launch a massive air strike against facilities of the Islamic State and Jabhat al-Nusra terrorist groups in Aleppo, Deir ez-Zor and Idlib provinces," the Defense Ministry said. The bombers destroyed five large weapons warehouses, three command centers and training camps the terrorists had been using in the area of Aleppo. "The strike wiped out five large warehouses containing weapons, ammunition, fuel and lubricants, militants’ training camps in Serakab, Al-Bab, Aleppo and Deir ez-Zor, three command centers near Jafra and Deiz ez-Zor and a large number of militants," the Defense Ministry said. Earlier on Aug. 16, Rossiya-24 reported that the Russian bombers had arrived at the Hamadan air base. This is the first time Russian planes have used an Iranian airdrome for the operation in Syria. On all previous occasions, Russia’s long-range bombers operated from airdromes in Russia, while front-line bombers operated from Hmeymim, Syria.